I have generated a simple plugin block with Drupal Console. I have added a managed file field during the generation process. Then I would like to translate this block. 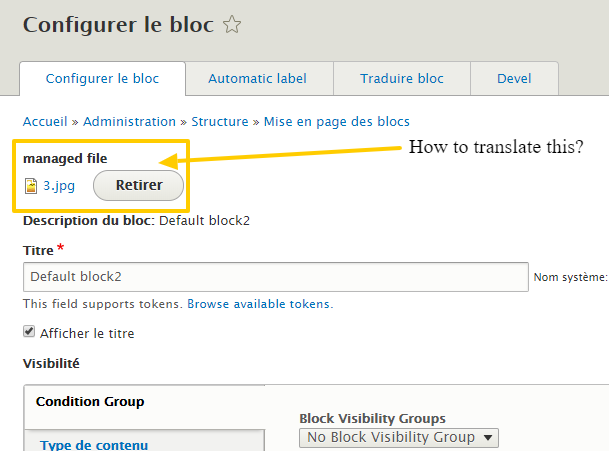 Unfortunately, this block does not expose the managed file field in the translation form. What can be done in order to get this file widget in the translation form? Is that even possible? I have tried to add settings in the schema.yml of the module, but it didn't add the field unfortunately. The config inspector tells me all is fine though as a sequence of integer. Browse other questions tagged 8 blocks i18n-l10n plugins or ask your own question. How to execute a custom code when a plugin instance is deleted?